“Doomed to extinction,” “irreversible decline,” “extinction is forever.” Those words are like lightning bolts that strike down periodically from the clouds of depression that follow me in the wake of animal extinctions. Species that have taken millions of years to evolve to their current state disappear, in some cases, in just a few generations due to habitat loss, invasive species or poaching. Nothing makes me sadder or more pessimistic. The good news is that the electrified words mentioned above are not always true. Take the Miami blue butterfly. This diminutive insect once ranged from Tampa Bay south to Key West, fluttering from flower to flower in dry, coastal habitats. Miami blue females lay up to 300 eggs and, historically, they were limited only by the availability of their host plants and predation. Then humans came along. Dry, coastal habitat equated to prime real estate for many, and it didn’t take long for Miami blues to disappear from virtually all of their historic range. The reason for this decline stems from an unfortunate aspect of Miami blue mobility. The butterflies rarely range away from the beach vegetation where they first emerged out of eggs. Once habitats became fragmented from one another, the chances of a Miami blue finding a non-sibling mate were almost impossible. By the time I was born in 1990, this butterfly could only be found among the vegetation along a few undeveloped beaches in the Florida Keys. Then Hurricane Andrew hit. The Category 5 hurricane slammed into South Florida in 1992, obliterating much of the remaining habitat of this tiny insect. Under natural circumstances, populations in destroyed areas would be replenished by other populations nearby. This was no longer possible and, so, with the hurricane went the Miami blue. For nearly a decade, no one could find a Miami blue and it was eventually feared extinct. 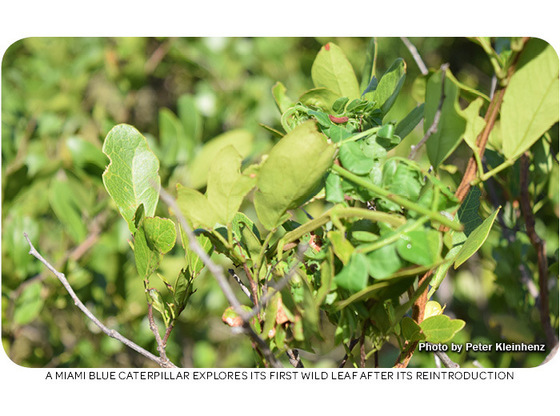 Then, an observant butterfly aficionado at Bahia Honda State Park noticed a butterfly that looked different than any they had seen there before. It was a Miami blue! Subsequent surveys showed that approximately 50 Miami blues survived in less than 1 square mile of habitat. Conservationists immediately rushed into action. 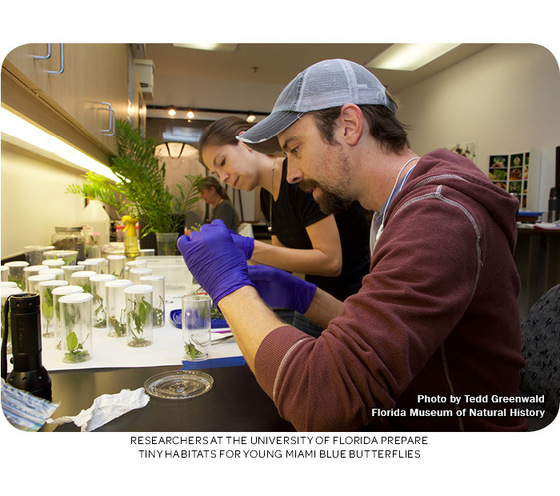 Wild specimens were collected and lepidopterists who study butterflies at the University of Florida created a captive breeding colony. The plan from the beginning was that offspring from this group would be used to create new populations in suitable habitat. But, first, you need suitable habitat. 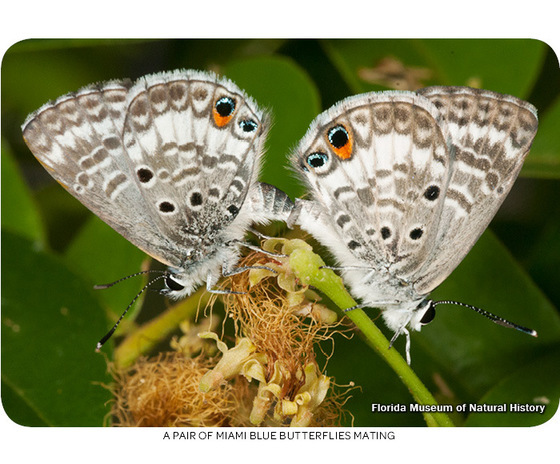 Miami blues, like all butterfly species, rely upon certain plant species that serve as “hosts” for their caterpillars. These little munching machines have a voracious appetite for gray nickerbean, blackbead and balloonvine. The adults are more liberal in their food choices, sipping nectar from many types of flowering plants. As such, there is a direct link between healthy wildflower populations and healthy pollinator populations. 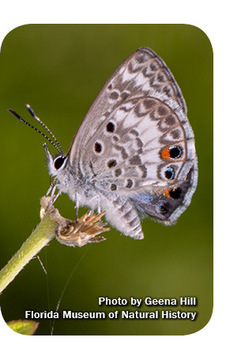 This fact has informed the management of an area that will likely become crucial to the Miami blue butterfly’s survival. 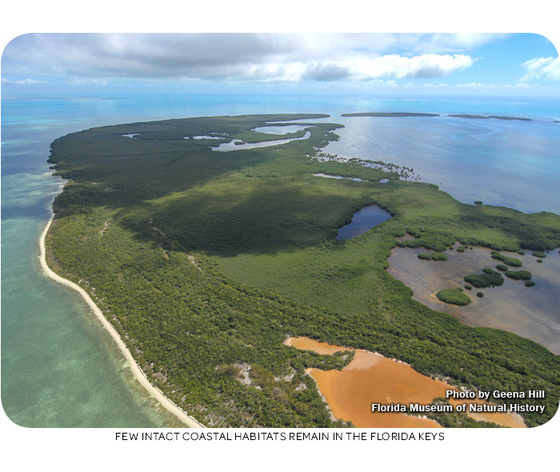 Florida Keys Wildlife and Environmental Area (WEA) consists of 4,250 acres, scattered from Key Largo to the Lower Keys. Some of these acres represent pristine examples of imperiled natural communities. Others have a long way to go. 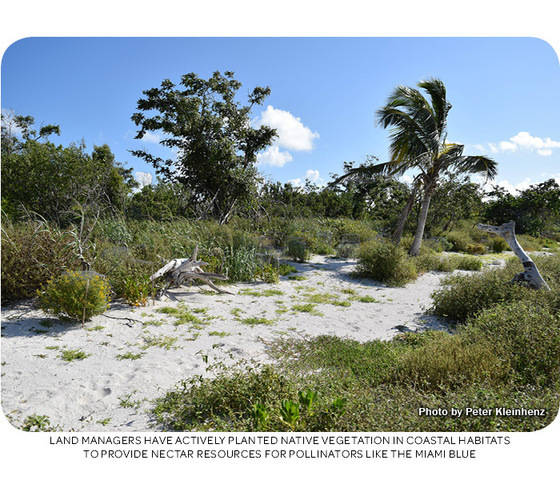 One such site, a degraded beach on Sugarloaf Key, was covered in an exotic plant known as scaevola. But area biologists Jeanette Parker and Susie Nuttall saw potential and got to work. Planting a variety of plant species helps the many wildlife species that depend upon these plants. 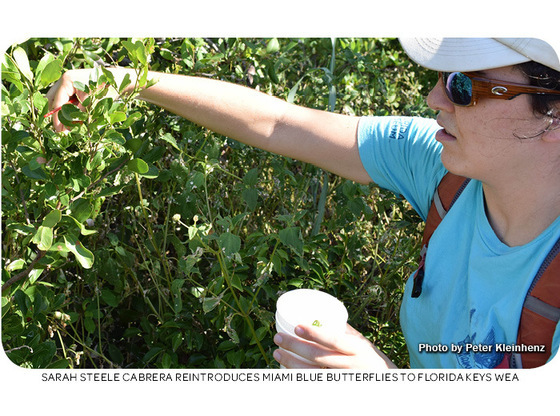 One species that Florida Keys WEA biologists had their sights set on from the beginning was the Miami blue. Susie and Jeanette planted a suite of species onsite to do just that. They surrounded the plants with wire cages to protect them from hungry (and nonnative) green iguanas. And then the wait for the missing pollinators began. It lasted until a fortunate set of circumstances unfolded, right when I happened to be in the area. A few weeks ago, I was down in the Keys with my coworkers to conduct site visits for new visitor projects in the area. The three of us were working on things that weren’t article-worthy when Jeanette, the lead area biologist, received an exciting phone call. 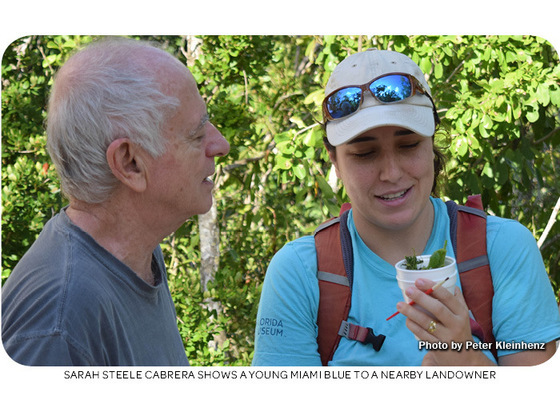 It turned out that the woman on the other end of the line, Sarah Steele Cabrera, is a lepidopterist at the University of Florida and she had some leftover Miami blue caterpillars from another project. Did Jeanette want some? Of course she did, and she kindly invited Catalina, Melissa and me to take part. Just a couple days later, we met Jeanette and Susie early in the morning for a small-scale, but significant, act of conservation. We reached the end of a road in a neighborhood right by the coast. Sarah met us there, along with a landowner whose property bordered the patch of coastal habitat we would be visiting. I watched as Sarah, Susie and Jeanette talked with the landowner about the value of conserving Miami blues and restoring habitat. The evidence that conversations like this matter surrounded us. Native pollinator plants, water features and bird feeders indicated that this landowner wanted his home to be an extension of the natural ecosystem that surrounded him. Sarah went to her car, grabbed some foam cups and held them out for us to see. She peeled back some netting to reveal a cluster of small leaves and even smaller caterpillars. They were Miami blues and were at the end of a lengthy journey. 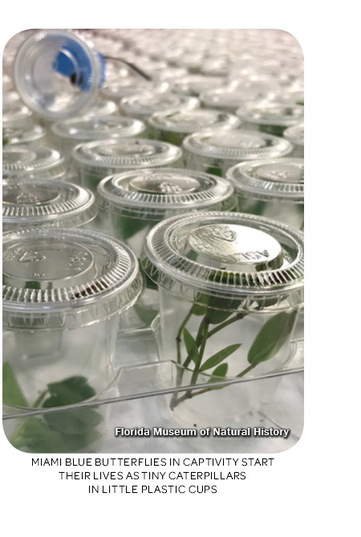 Students in the University of Florida lab of Dr. Jaret Daniels have been raising Miami blue butterflies in captivity to provide stock for future releases. A couple of weeks before our visit, such a release occurred at Long Key State Park. The cup Sarah held in her hand housed “leftovers.” The little green and brown specks didn’t look like much but, after Sarah gave us more details how these caterpillars got here, we didn’t doubt their value. The six of us trudged through vegetation that ultimately opened up onto a beach, facing the deep blue water that separated us from Cuba by only 100 miles. 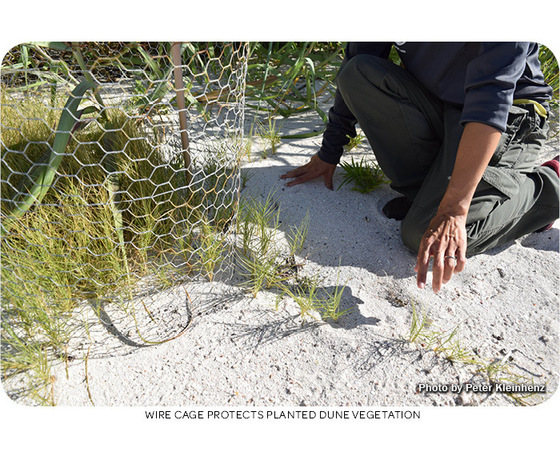 The beach was punctuated by metal cages that surrounded unusual plants including sea lavender, Joewood and inkberry. These, Susie noted, were planted just a few months ago. All were spreading beyond their cages, establishing themselves on one of the few truly natural beaches in the area. The stage was set. The only thing missing were the actors. Sarah walked Susie and me up to some gray nickerbean. She opened the cup, took out a small paintbrush and allowed a caterpillar to crawl onto the bristles. Sarah then placed the brush next to some leaves and prodded the caterpillar to crawl onto the first wild vegetation it had ever felt. We collectively scattered caterpillars on any gray nickerbean or Florida Keys blackbead we found until Sarah’s little cup was empty. Now, the caterpillars were on their own. Well, sort of. Miami blues have a symbiotic relationship with certain ants that keep them safe from marauding parasitic wasps. In return, the ants “milk” the caterpillars for sweet secretions. 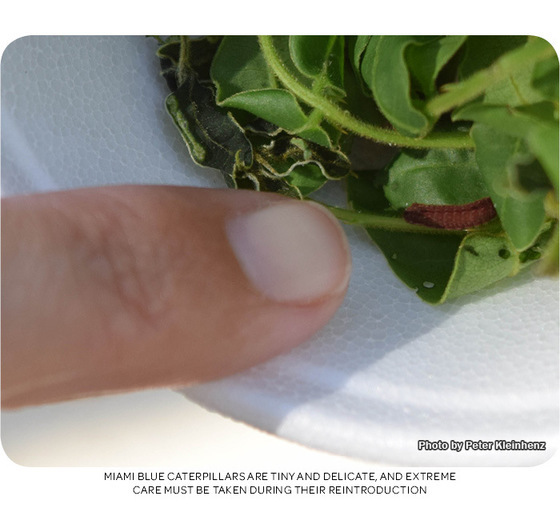 The team hopes that ants will find these reintroduced caterpillars and keep them safe for the month or so that it takes for them to transform into butterflies. While not necessarily essential to Miami blue survival, this relationship illustrates the fact that reintroductions consist of more than simply releasing a bunch of animals back into the wild. Any animal's strand in the web of their ecosystem must be fully considered for a reintroduction to truly succeed. I’ve thought a lot about that morning since it happened. I, and many others who work for the Florida Fish and Wildlife Conservation Commission (FWC), consider conserving wildlife to be the prime motivator for why we are in this field. To take part in it so directly was immensely rewarding and restores my faith that maybe we can turn around the current trend of species extinctions. I’d have to agree. For it seems, with creativity and dedication, extinction can sometimes be just temporary. 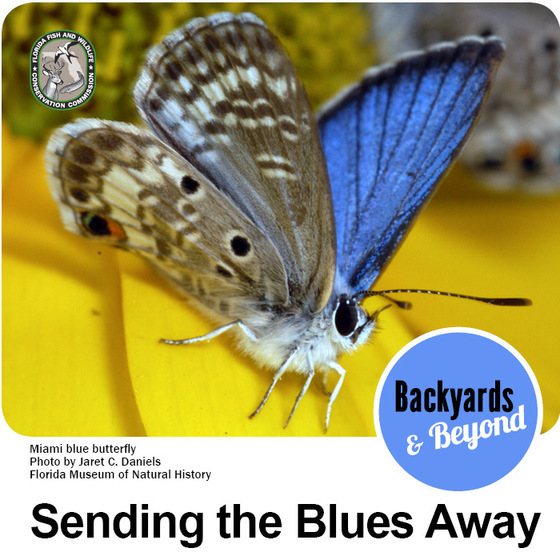 FWC has numerous resources to learn more about butterflies and ways to help their populations. Visit the Great Florida Birding and Wildlife Trail website to find places to observe butterflies and get rewarded for finding new species. For tips on observing butterflies in one of the best places in the state to see them, visit the Big Bend WMA Butterfly Guide page. 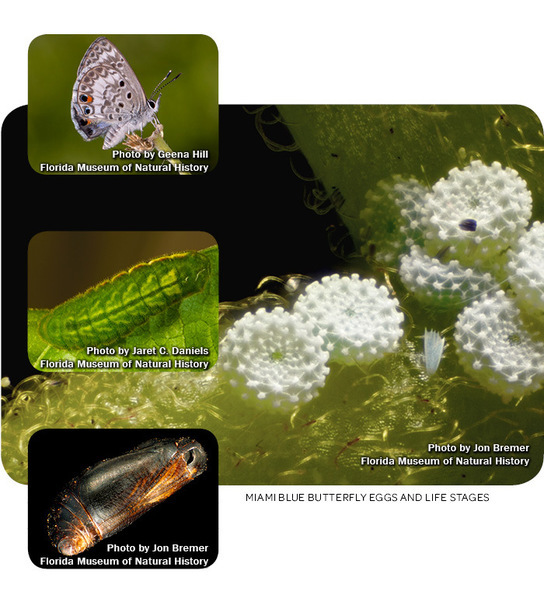 Be sure to join our Pollinators of Florida project on Florida Nature Trackers to add your observations to our statewide database. Finally, you can help butterfly populations by planting a refuge for wildlife or joining us in our Backyards and Beyond campaign. and the City Nature Challenge.